‘KALSI’ T.E.F.C. 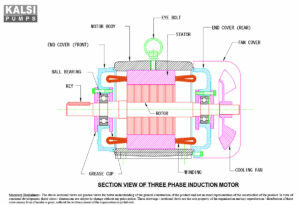 squirrel cage Three phase Energy-efficient induction motors are ISI marked as per IS 12615 : 2011 having insulation class B in 2, 4 and 6 pole design with Efficiency level IE2. These motors are tested to strict quality control for routine and Type tests at every stage of production and are ideally suitable for various industrial applications. MOTOR FRAME : Motor frame is made from robust cast iron of high tensile strengh with integral feet and is totally enclosed fan cooled type. Cooling ribs are provided on all faces to ensure equal dissipation of heat. 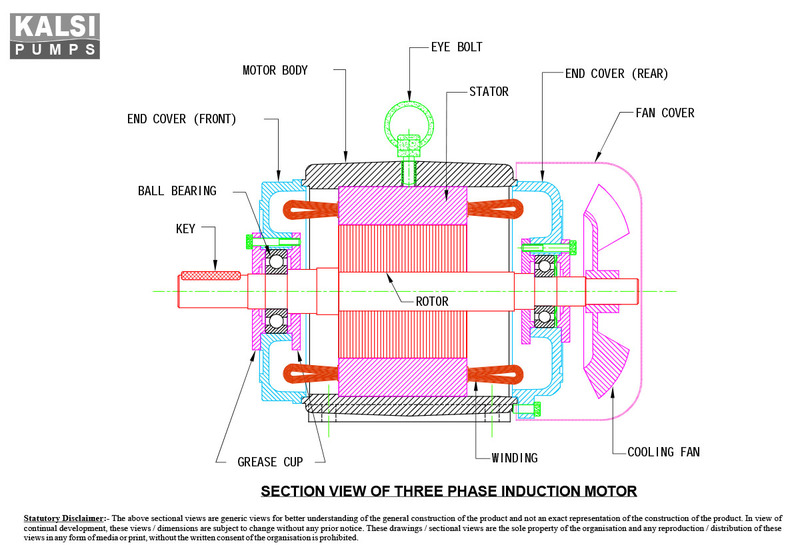 STANDARDS : Performance characteristics of Three Phase motors conform to IS 12615 : 2011. The foot-mounted motors have standard dimensions as per IS : 1231 while dimensions of flange-type motors conform to IS : 2223. VOLTAGE AND FREQUENCY : Three-phase motors are designed for 415V ± 10%, 50 Hz ± 3%, A.C. Supply, Duty S1. PROTECTION : Motors have IP 44 degree of protection and confirm to IS : IEC 60034-5. Motors having IP 55 degree of protection are also available on demand. RATING : Motors are rated for continuous duty S1 with an ambient temperature of 40°C and altitude up to 1000m above mean sea-level. STATOR : Induction type stators built of hydraulically compressed high silicon steel insulated laminations, rigidly cleated, wound with super enamelled copper wire, impregnated with best quality stoving vanish and provided with high class insulating materials. ROTOR : The motors are provided with high-pressure aluminium die-cast rotors to ensure improved reliability. All rotors are dynamically balanced on dynamic balancing machines for vibration and noise-free running. TERMINAL BOX : Standard motors are provided with terminal box positioned at right-hand side when looking at the driving end. Terminal box is of adequate size for easy connection & maintenance. INSULATION : The motors have Class B insulation. Motors of insulation Class F also available on demand. COOLING & VENTILATION : Type of cooling is IC41 as per IS: IEC 60034-6. 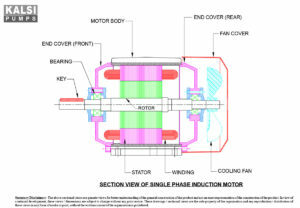 All motors have external fans for cooling, ensuring dissipation of heat. TESTING : All electric motors are tested for electrical and mechanical tests at intermediate and final stages of production as per Scheme of Testing and Inspection for relevant B.I.S. Standard. KALSI / KELCO T.E.F.C. 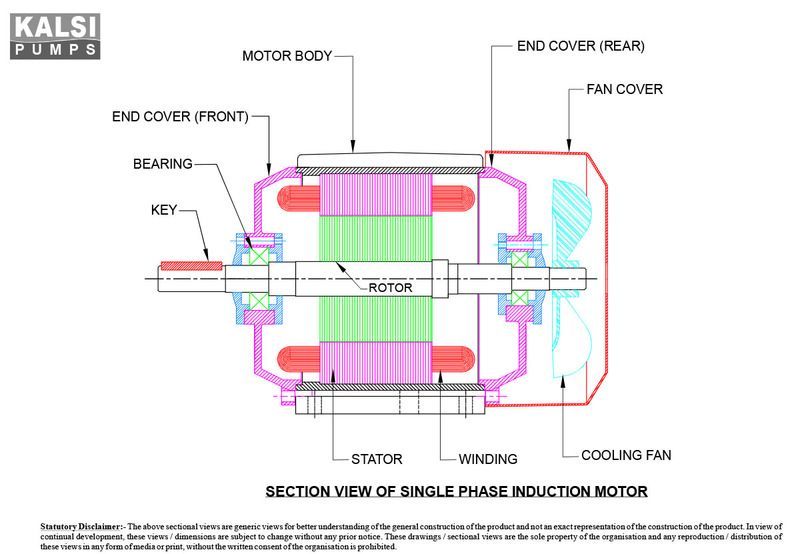 squirrel cage single phase induction motors having insulation class B in 4 pole design. These motors are tested to strict quality control for routine and Type tests at every stage of production and are ideally suitable for various industrial applications. MOTOR FRAME : Motor frame is made from robust cast iron of high tensile strength with integral feet and is totally enclosed fan cooled type. Cooling ribs are provided on all faces to ensure equal dissipation of heat. STANDARDS : Performance characteristics of single phase motors conform to IS : 996 . The foot-mounted motors have standard dimensions as per IS : 1231. 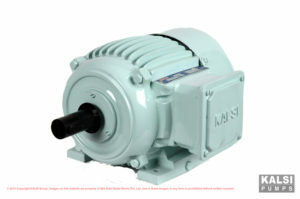 VOLTAGE AND FREQUENCY : Three-phase motors are designed for 220V ± 6%,50Hz ± 3%,A.C.Supply. PROTECTION : Motors have IP 44 degree of protection and confirm to IS : 4691. RATING : Motors are rated for continuous duty with an ambient temperature of 400C and altitude up to 1000m above mean sealevel. 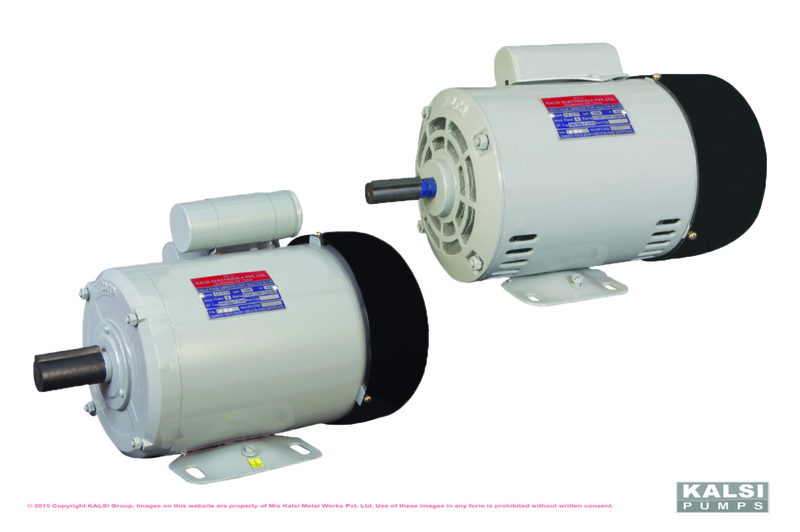 These motors are available from 0.5HP to 3.0HP rating. STATOR : Induction type stators built of hydraulically compressed electrical steel insulated laminations, rigidly cleated, wound with super enamelled copper wire, impregnated with best quality stoving varnish and provided with high class insulating materials. ROTOR : The motors are provided with high-pressure aluminium die-cast rotors to ensure improved reliability. Each rotor is dynamically balanced on dynamic balancing machine for vibration and noise-free running. INSULATION : The motors have Class B insulation. COOLING & VENTILATION : Type of cooling is IC41 as per IS:6362. All motors have external fans for cooling, ensuring dissipation of heat. TESTING : All electric motors are tested for electrical and mechanical tests at intermediate and final stages of production as per Scheme of Testing and Inspection for relevant B.I.S. Standards.